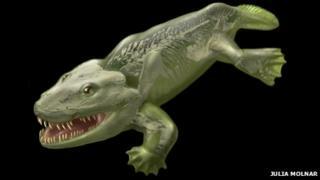 Textbooks might have to be re-written when it comes to some of the earliest land creatures, a study suggests. Researchers have found that our understanding of the anatomy of the first four-legged animals is wrong. New 3D models of fossil remains show that previous renderings of the position of the beasts' backbones were actually back-to-front. The findings, published in the journal Nature, may even change our thinking on how the spine evolved. The scientists looked at a group of animals called the tetrapods, examining three creatures called Ichthyostega, Acanthostega and Pederpes. These primitive four-legged animals are of great interest to palaeontologists: they were the first creatures to haul themselves out of the oceans, paving the way for all future vertebrate life on land. Studying how these animals are put together is key to understanding how they made this transition. The researchers from the University of Cambridge and the Royal Veterinary College (RVC) used the European Synchrotron Radiation Facility (ESRF) to bombard the 360-million-year old fossils with high energy X-rays. This enabled them to create detailed computer reconstructions of the prehistoric animals. RVC's Prof John Hutchinson said: "Their vertebrae are actually structurally completely different from what everyone for the last 150 or so years has pictured. The textbook examples turn out to be wrong." The scientists found that parts of the spine thought to face the front of the animal, in fact faced the back - and vice versa. They also discovered the earliest known evidence of a breastbone in Ichthyostega. Prof Hutchinson said the findings provided more clues about how the early animals physically moved out of the water and on to land. An earlier paper by the same team suggested that the tetrapods dragged themselves out of the sea, using their front legs to haul the rest of their body along the ground. The new anatomical findings backed this up, Prof Hutchinson said. The study also shed more light on how the modern backbone evolved. He explained: "All of that anatomy [from these early land animals ] was handed down to later animals. "It influenced the future evolution of the spine in everything on land. It tells us about our own development and why our own backbones developed they way they did."